I had never realized that unless you travel north to Cherry Hill or Collingswood’s surrounding areas, or you make the trek into the city of Philadelphia, there are not many places to get a nice lunch around good ole’ Clarksboro, New Jersey, unless you’re sitting in your mom’s kitchen. Don’t get me wrong... I can find you the best Italian hoagies or cheesesteaks -- and the best slices of pizza this side of the Mississippi, (No, I’ve never been to Chicago, but I like my pizza thin and cheesy) but I’m talking about a place where you don’t use paper napkins, and they don’t have bottles of ketchup on the table for the fries you’ll inevitably get with your meal. Now, who doesn’t love a good pizza place or deli? But sometimes, you like to fold your napkin neatly in your lap, as your vested server in a bow tie let’s you know the “fresh catch of the day” while the sun is still shining. 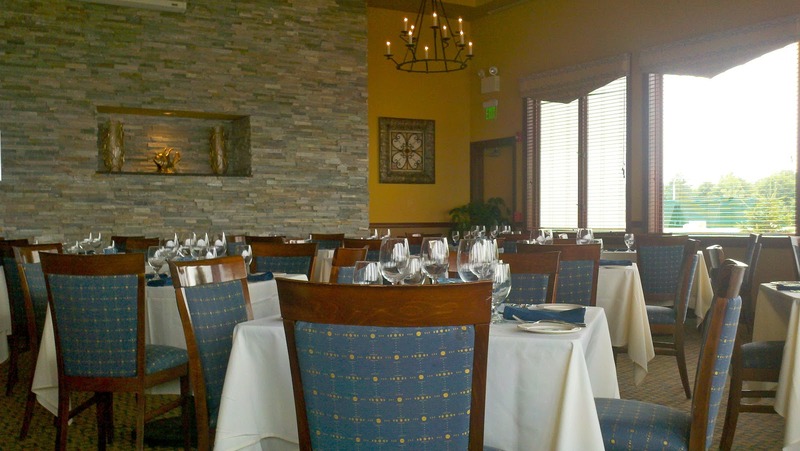 All of this brings me to Riverwinds Restaurant, located in the Riverwinds Community in West Deptford, New Jersey, constructed for the “55 and older” generation. Besides just the newly built houses, in the community, located just off the Delaware River, you will find a brand new gym, a skate park, a senior center, youth programs, and much more. 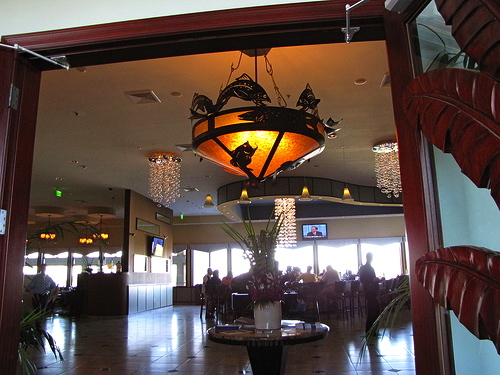 Riverwinds Restaurant, which overlooks the river and allows for a perfect view of takeoffs and landings at the Philadelphia Airport, sits at the far back of the community, about a three to five minute drive from the entrance. 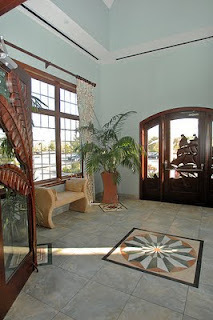 When you walk in the front door, you feel as though you just walked into a resort hotel. 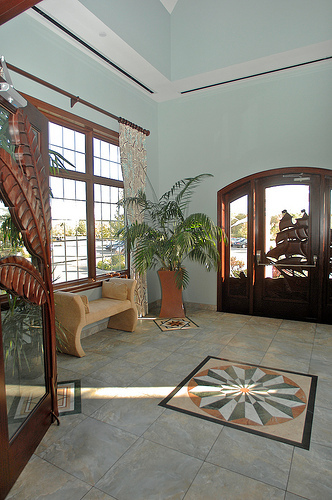 The chandelier has outlines of fish entangled around it, and the lobby is equipped with palm trees and other exotic plants. There are huge floor-to-ceiling windows located throughout the entire restaurant, which allows for an enormous amount of natural light -- which I love and believe is a key element in a restaurant’s look, and gives it a very modern and upscale feel. As soon as my sister and I walked in, the aesthetics of the entire restaurant had already started my experience off on a high note. We were escorted to our table by the hostess, who wasn’t overly friendly, and didn’t have much of a personality, but I was in such awe of the beautiful dining rooms, I didn’t really notice, or care too much about the hostess with her nose in the air. 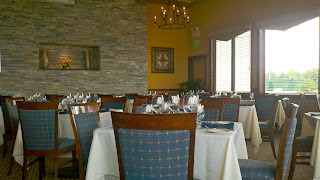 We were brought to a table directly in front of one of the large windows, and greeted almost immediately by our server. 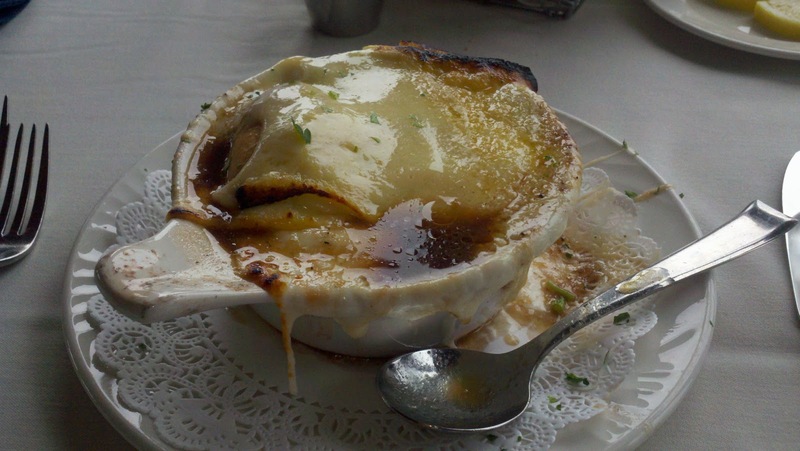 We started the meal with two glasses of water, and I ordered a crock of French Onion Soup while Andrea and I continued to look over the menu. We opted for the Prince Edward Island Mussels with Chorizo as an appetizer. I also wanted to get the Crab Stuffed Cremini Mushrooms, but Andrea kindly reminded me that I had already gotten the soup... and she was right. (Although I totally could have eaten it all). My soup came out and we ordered our appetizer and our meals. Andrea ordered Parmesan Crusted Chicken, which she had already been eyeing since I showed her the menu online before we left. I couldn’t decide between the Chicken Paisano that was on the menu, or the Four-Cheese Chicken Pasta that was on special that day. I opted for the Chicken Paisano, because it had artichoke hearts and sun-dried tomatoes in it. After we ordered, I dug into my French Onion soup. I guess, as much as you can really “dig” into soup. The broth hit me immediately; it was so sweet, so tasty, and not too salty, like some broths sometimes can be. The onions were cooked perfectly, and the bread they tucked underneath the melted cheese was still a bit crusty. It was a great blend of onions, too. The Vidalia onions made it really sweet and there were shallots in it that gave it such great flavor. The only complaint I had, is I didn’t like the flavor combination of the cheeses. It tasted a bit like Swiss, but it said on the menu that it was Gruyere and Provolone. I prefer just provolone, or mozzarella. And besides a small burnt edge, the soup was perfection. About five minutes later, our Mussels and Chorizo came out. They smelled really good, and I was most impressed with the fact that they incorporated the chorizo. Sometimes pancetta, sometimes spinach or diced tomatoes, but I had never had chorizo in my mussels. Truthfully, that’s what sold me on getting that appetizer instead of the mushrooms. 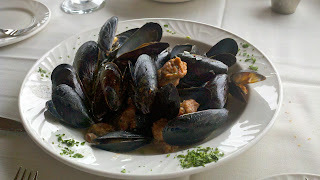 Anyway, the mussels weren’t spectacular, they were tasty, just the way all the other mussel appetizers I ever get are. There was a mix of shallots, parsley, garlic, butter and white wine, with the sauteed chorizo. No complaints at all, just nothing that sparkled about them, except for the chorizo. However, the broth was good enough to dip a few pieces of the crusty bread to soak it up. A little while later, our lunch arrived. Imagine this: you’re sitting in a restaurant, and when they bring out what you think is going to be your food, the plate is just filled with stacks of $100 bills. That’s how excited I was when they put our plates down. Not only excited because the food looked so spectacular, but also because I knew I had finally found a perfect lunch spot for when I am in New Jersey, that’s not too far from home. 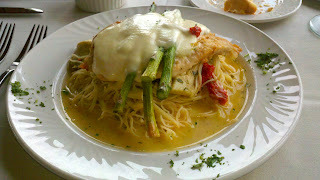 My chicken breast was situated atop a large portion of angel hair pasta, with a garlic and white wine sauce. In the pasta, there were sun-dried tomatoes and large chunks of artichoke hearts. The chicken was topped with grilled asparagus spears and melted fresh mozzarella cheese. 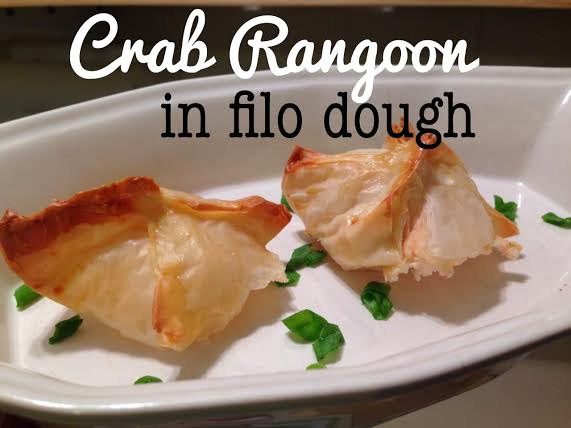 I could only get down about five or six bites, but those bites were some of the best I’ve had in a while. The chicken tasted as though it was pan-sauteed, and it had a nice char on the outside with great flavors. It was nice to see that it wasn’t just a grilled piece of chicken... it was so much better. The sauce on the pasta was so good, and very light, perfect for the angel hair, and perfectly paired with the artichoke hearts and tomatoes. I appreciated the fact that they didn’t try to doll it up with anything crazy, like too much basil or big chunks of garlic. And as delicious as my dish was, Andrea’s was even better. Her chicken was prepared the same way, however, it was topped with a crispy Panko breadcrumb-parmesan cheese mix, instead of asparagus and fresh mozzarella. 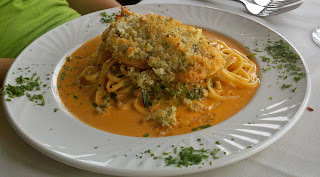 The chicken was served over a bed of linguini pasta in a creamy blush tomato sauce, and tossed with broccoli rabe. From the couple bites I had of that, the chicken was cooked perfectly, again, and the Panko and parmesan gave it such great texture. The blush sauce was sweet and savory at the same time. The tomato sauce gave it a fruity flavor, and mixed with the bitter broccoli rabe and a touch of cream, it all came together perfectly.